You can find phyllo or filo dough in pretty much any grocery store. They are relatively cheap, too. But the food and desserts you can make out of them are countless. 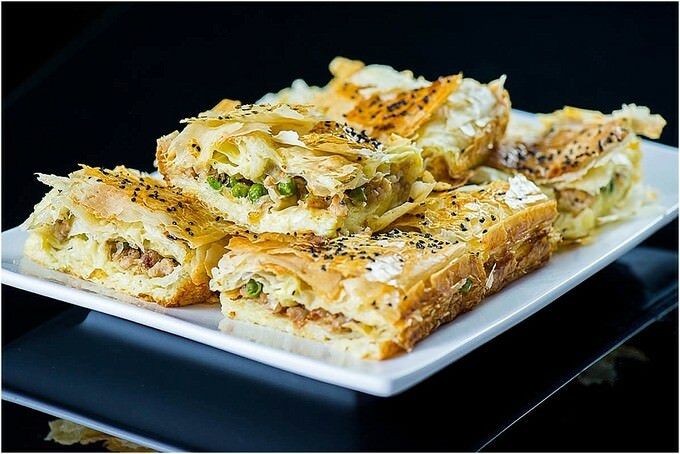 I have quite a few recipes that I make with phyllo though and this one in particular will remind you of chicken pot pie. This phyllo chicken pie is creamy inside, but is not soggy. The layers are flaky and moist. I make this recipe for either breakfast or as a side for a lentil soup. Goes “oh, so well” together. Give this recipe a try and let me know what you think about it! We are going to start off by cooking the meat mixture, which will go inside of the pie. 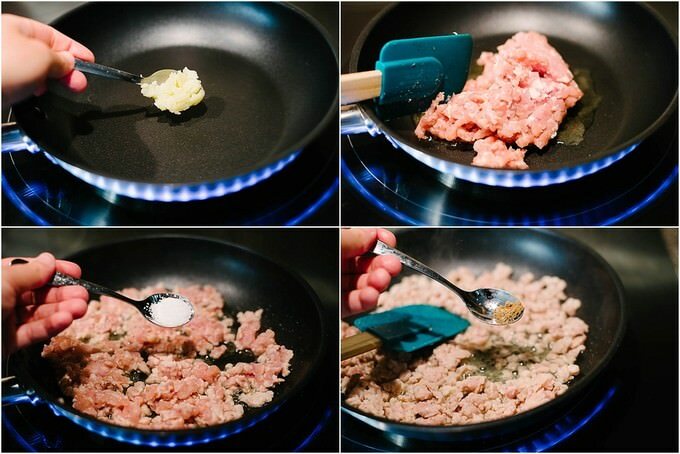 Heat a small skillet on MEDIUM HIGH, melt 1/2 TBSP butter or clarified butter. 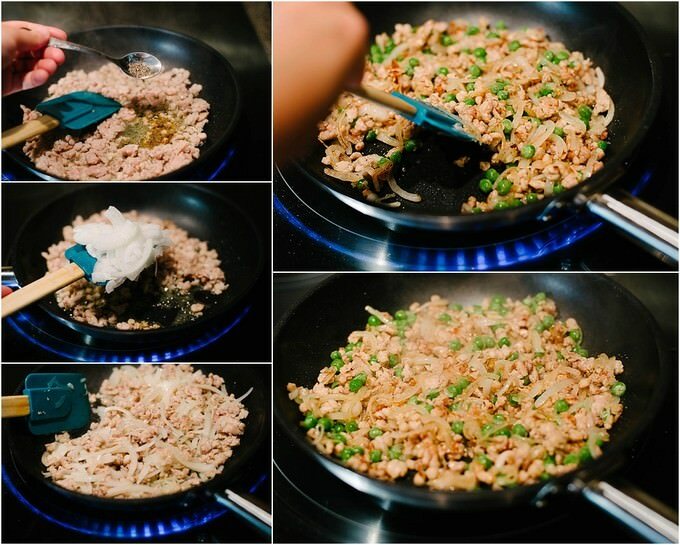 Place 1/2 lbs ground chicken, add 1/2 tsp salt, 1/4 tsp cumin powder, 1/4 tsp black pepper and mix everything well. Saute the chicken and spices for a couple of minutes. Add thinly sliced onions into the skillet and saute until the onions turn transparent and chicken starts browning. Add 1/2 cup of frozen green peas. Mix everything a couple of times and take the skillet down from the heat. In a medium bowl combine 2 eggs, 1-1/2 cup milk, 2 TBSP avocado oil (or liquid oil of your choice), 1 TBSP melted butter, 1/2 tsp salt. 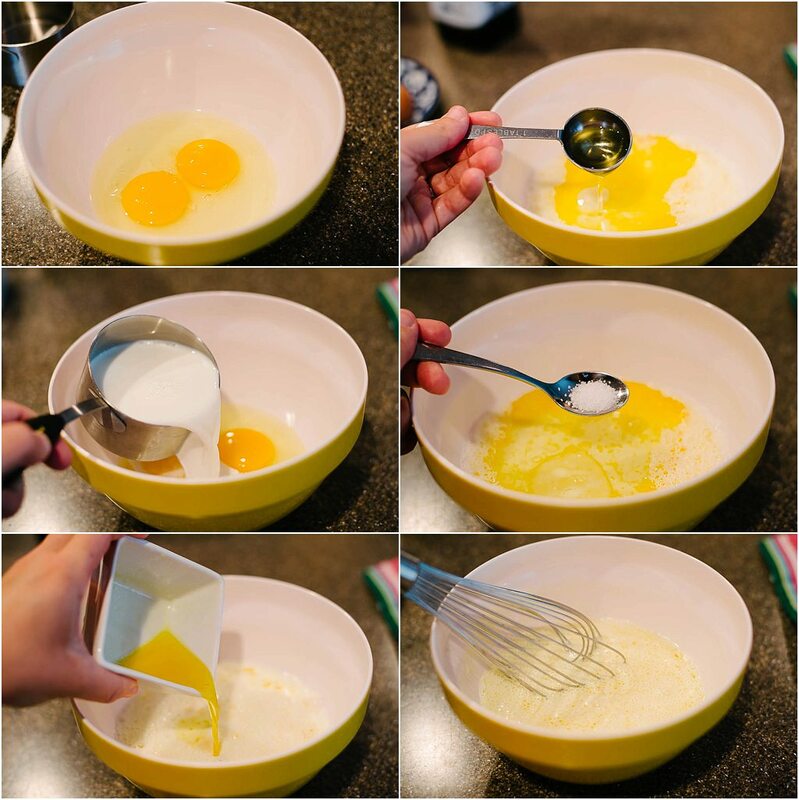 Give the mixture a nice whisk and set it aside to be used shortly. Open up the box of phyllo dough and roughly separate half of it. The remaining amount should be wrapped in the plastic wrap, put back into the box and kept refrigerated until next use. Keep the amount you’re going to use wrapped in the plastic until you’ll need it. Grease 10×12 inch baking pan (or something close in dimensions) and start laying the phyllo layers. Phyllo dough is going to be too large for your pan. That’s the whole idea for creating layers and using the longer sides as a tuck to keep the moisture inside the pie. Lay the first sheet of phyllo starting from the longest edge of the pan and let the opposite side of the dough hang over the opposite edge. Place the second dough the exact opposite way. You should have two phyllo dough with opposite sides handing from the sides of the baking pan. Using a spoon pour 2-3 TBSP of milk mixture over the dough and evenly spread the milky mixture with a brush. Close one of the overlapping sides, covering the milky mixture. Add 2 TBSP of milk mixture on top of the covered dough and use the other side of the overlapping dough over the milky mixture. At this point you shouldn’t have any dough hanging from the sides. 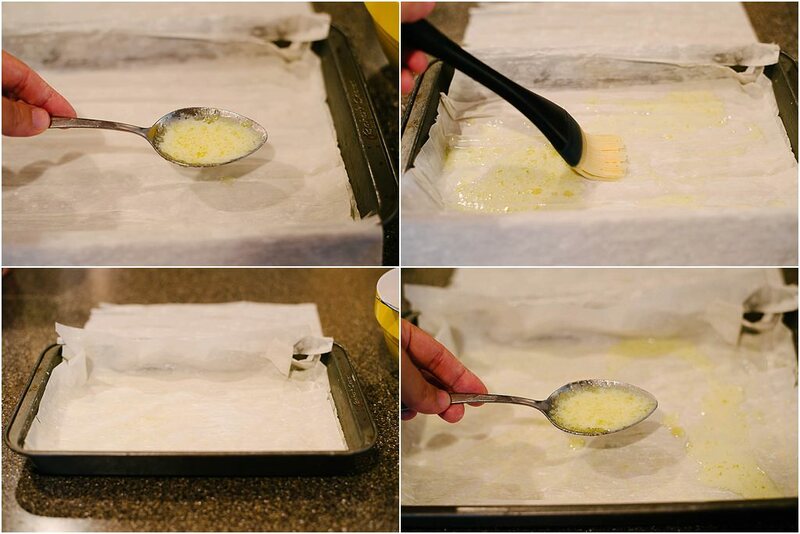 Continue this process until you are done with more than a half of the dough. 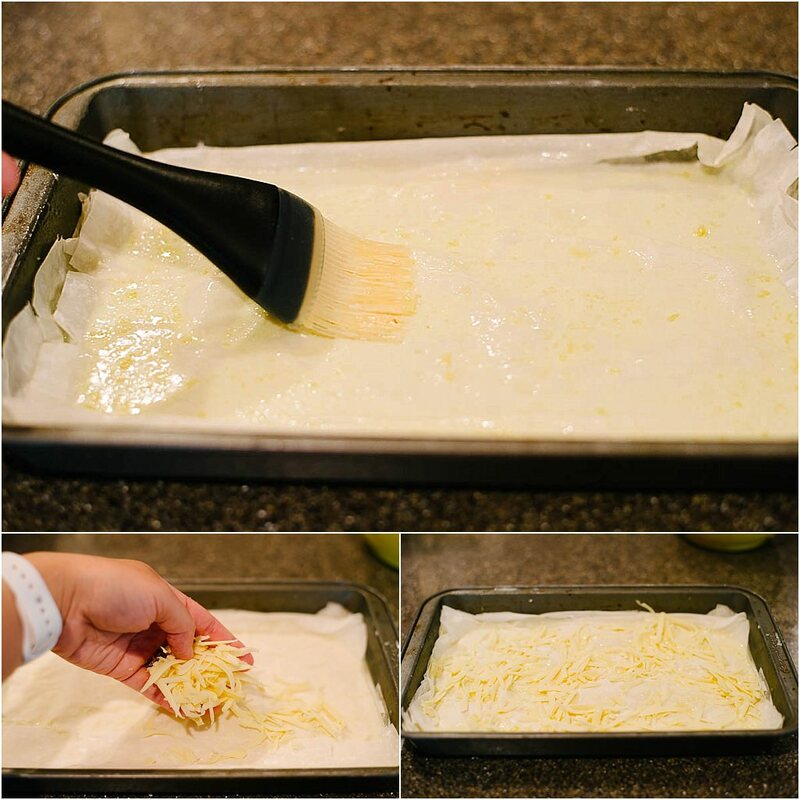 Once you reach that point, spread shredded cheese on the last year, place one more phyllo sheet, brush 2-3 TBSP of milky mixture, cover that layer up with an overlapping side, brush another 2 TBP of milk mixture, place one more sheet of phyllo. Evenly spread the meat mixture on top of your last layer. Place another phyllo sheet over the meat mixture. Pour 2 TBP of milky mixture and spread it out with a brush. 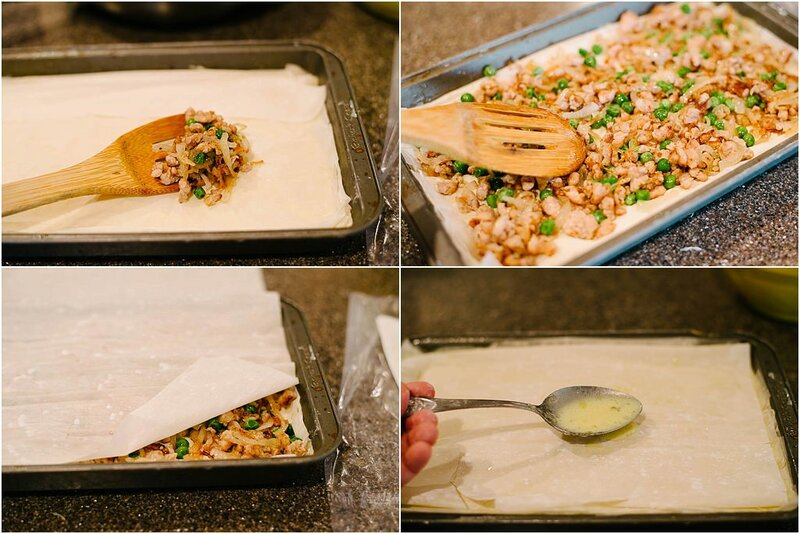 Continue layering the phyllo sheets until you are done with all of them. According to my calculations, you should have enough milky mixture for the entire process. The last 2-3 TBSP should be left for the top of the pie. PREHEAT the oven at 365F. Pour remaining milky mixture over the top of the pie and evenly spread it out with a brush. Spread nigella seeds or sesame seeds on top of the pie. Place the pie in the preheated oven and bake it until the top of the pie is golden brown. It typically takes me about 20-25 minutes to bake. That’s quite enough considering that we are adding cooked chicken inside the pie. If the pie is blowing up like a balloon, don’t panic. It will all deflate once you get into cutting it into slices. This is it, you guys! Aside from explaining (trust me, once you get a hold of it, the process is a breeze) the layering part, this pie is super-duper easy. I hope you will like this phyllo chicken pie recipe as much as my family does. Thank you for a kind comment!